Wire/Connector For A Game Controller? > Wire/Connector For A Game Controller? I want the controller to have a wire sticking out with a connector that I can plug into my other projects. I want the connection on my controller's side to be sturdy and permanent, and I would like use a male/female connector that has a simple, easy to add female/male counter-part that I can include in my other projects that will enable me to simply plug in my controller. 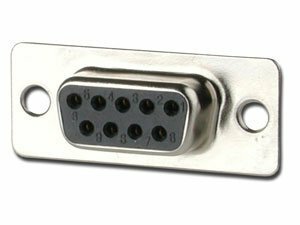 I did a lot of research and so far I decided on a female DB-9 connector like this that will have 8 wires (6 buttons, 2 power) coming out and into a board on my controller. 1) is there a better way? 2) what is the best way to create my controller wire (the one with 6 wires)? Right now I plan to cut up some ethernet cable. 3) How do I solder those wires permanently on the controller's board so that the wires won't break? This is my biggest concern. Re: Wire/Connector For A Game Controller? If you are outputting power on any connector, do it in the safest way. Even if we're talking 5 or 3.3 volts. Having male connectors on your devices, means having pins sticking out in some way and exposing the power you are supplying. Better way would be to use female connectors, where the contacts are better protected against accidental shorts by any intruding objects. Of course that would end up in your (mobile) controller to have more or less exposed (and therefore a bit more risked to get damaged) pins. Create some way of strain relief inside your controller. This could be a clamp to screw the cable to the casing, or a 's' shaped channel tight enough to just fit your cable, or both. So if your controller housing just fits the PCB, create some space on the PCB to hold the strain relief contraption you come up with. I understand you're already done with the casing so incorporating something like a 's' shaped channel would be a bit of a problem. Thank you so much! 'Strain relief'... exactly the terminology I wa slooking for. I appreciate it a lot!